Whatever can be said against Jansson, it’s not that he doesn’t remain true to himself throughout his productions. For like its predecessors, his aforementioned blog is also characterized by misrepresentation of evidence (or omission of inconvenient evidence that Jansson is well aware of), straw-men and/or other argumentative fallacies, rhetorical bluster and classic "Revisionist" ill-reasoning. One also sees Jansson trying to make look like central to my argument a source that, in the context of my writings, does not have the importance that Jansson claims it has. - I argue that the required amounts of gasoline would have been quite affordable within the context of the German war effort (of which exterminating the Jews as perceived dangerous subversives and resource-wasting parasites was a part) at the time when the bodies were cremated, pointing out in this context that, even at a later time when the Reich had lost almost all of its petrol resources and its war machine was bogging down for lack of fuel, in February 1945, German authorities didn’t consider it a waste to spend an estimated 68,000 liters of gasoline within 13 days (more than twice the daily consumption of an entire Panzer division in 1941) on municipal sanitation purposes in burning 6,865 corpses of air raid victims on the Dresden Altmarkt. So these are my "claims on Dresden" in the HC critique. Now let’s see what Jansson has got to offer against these "claims". Muehlenkamp relies on the books by David Irving and Frederick Taylor. Irving gives no source for the statements concerning cremation, while Taylor cites a book by Götz Bergander, who refers us further to a document collection where we find that the only source for Muehlenkamp’s description of the cremations is a testimony from Theodor Ellgering dated December 20, 1955. This is far too weak a source to have any value for the discussion of a technical problem concerning the practicality of mass cremation. Actually, as readers of this blog may recall, the importance of Ellgering’s testimony (which Jansson was well aware of but kept silent about until I pointed it out), as a source of Taylor’s (via Bergander) and mine, is limited to one specific aspect of the Dresden cremations, namely the use of gasoline for burning the corpses, as Ellgering expressly mentioned that, in his capacity as Geschäftsführer Interministerieller Luftkriegsschädenausschuβ (Manager of the Inter-ministerial Air War Damage Committee) in charge or directing relief measures after the bombing attack on 13/14 February, he had to his regret been "forced to grant permission for the burning of the corpses, which took place on the Altmarkt, where they made giant grates with iron girders, on each of which 500 corpses were piled up in pyres, drenched with gasoline and burned". - The Schlußmeldung über die vier Luftangriffe auf den LS-Ort Dresden am 13., 14. und 15. Februar 1945 (link provided by Jansson himself in an earlier forum discussion). This document mentions that, due to the progress of decomposition, difficulties in recovering the corpses and the lack of suitable vehicles for transporting corpses to the cemeteries, 6,865 corpses had been cremated (eingeäschert; the verb’s infinitive form einäschern can also be translated as "to burn to ashes") on the Altmarkt with the permission of the Gauleiter and the city administration, and that the "ash" of the "fallen" ("die Asche der Gefallenen") had been transported to a cemetery. So besides the aforementioned photographs we have two (other) contemporary documents, conveniently swept under the carpet by Jansson, suggesting that the cremation on the Altmarkt had been successful to the extent of reducing the corpses to cremation remains small enough to be loaded into "boxes or sacks", to be transported to the cemetery (despite the lack of suitable vehicles for transporting whole corpses, mentioned in the Schlußmeldung), and to be poured from those boxes or sacks into the soil of mass graves – cremation remains that both sources referred to as "ash" or "ashes". It’s easy to understand (considering the man’s amply demonstrated dishonesty) why Jansson doesn’t write a word about these documents, which have been abundantly rubbed under his nose. The pictures of the Dresden pyres offer little help, as they do not show the conduct of a cremation from beginning to end. 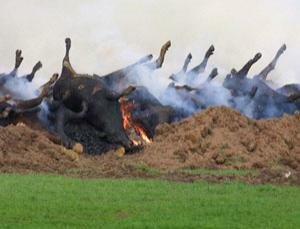 In any large-scale pyre cremation (as seen for example in the extensive photographic record from the 2001 UK foot-and-mouth disease epidemic), there will be an initial period of rapid burning in which the pyre is engulfed with large flames, followed by a longer period of slower burning (possibly with periodic refueling) as the pyre burns down. The photos of the Dresden pyres show at most rather weak flames, consistent with the burning-off of a modest quantity of liquid fuels – nothing like the initial period of burning in a genuine pyre mass cremation – yet they also show largely intact bodies, too intact to be consistent with the latter phase of a successful pyre cremation, after the initial period of rapid burning. Jansson must be referring to the second of Hahn’s photograph’s reproduced below, for regarding the first one has to be Jansson to see "rather weak flames", supposedly "consistent with the burning-off of a modest quantity of liquid fuels" and "largely intact bodies". 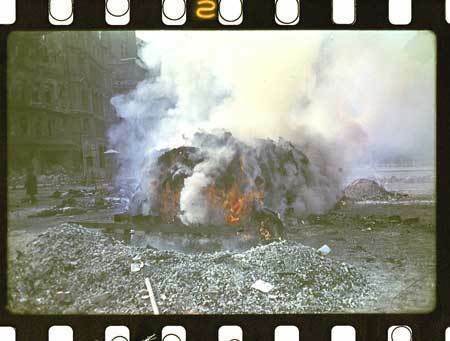 So if these FMD pyres eventually resulted in complete cremation, then Dresden pyres can (especially considering the documentary evidence mentioned above) be assumed to have achieved the same, or at least a far more thorough degree of cremation than Jansson is prepared to admit. As a further argument against the Dresden Altmarkt evidence, Jansson feebly muses that his "mentor" Joseph Goebbels "does appear to have desired to use the Dresden attacks for propaganda". Certainly so, but there’s no evidence that images of corpse cremation were used for propaganda purposes either internally or externally; if they had been, there would have been a camera team from the Reichspropagandaministerium on the Altmarkt as opposed to a lone photographer taking pictures despite a prohibition to do so, and the photos would have been shown in the Wochenschau and sent to the neutral press – none of this happened. Despite this certainly primitive kind of burial we stood before the necessity to further accelerate the pace, for due to the mild weather the corpses began to decompose. Due to this a pestilential stench spread over the completely destroyed inner city. It was urgently necessary, for public health reasons, to accelerate the recovery of the corpses. However, the suggestion made from many sides to bury the dead in the municipal green areas – i.e. on the spot – was not executable according to the hygienists’ opinion as it would imperil the drinking water supply. In order to prevent the outbreak of epidemics, the old town was declared a restricted area. There was no choice but to … grant permission for the burning of the corpses, which took place on the Altmarkt, where they made giant grates with iron girders, on each of which 500 corpses were piled up in pyres, drenched with gasoline and burned. The above doesn’t suggest that Ellgering considered the Dresden pyres proper (as opposed to the bombing attacks that had, among other things, made the use of these pyres necessary) to be a "symbol of Allied atrocity". The only thing that becomes apparent from the above is that Ellgering felt compelled to explain why the decision to burn the corpses in the open, which he regretted (presumably because he considered it a particularly undignified form of body disposal), had to be authorized. So unless Jansson should provide a comprehensive quote supporting his "symbol of allied atrocity" claim, I’ll assume that we are before another of Jansson's deliberate falsehoods. Skipping Jansson’s further "we don’t know what happened" cant, I move on to his claim whereby cremations in Dresden would have "proceeded in a fashion enormously superior" to cremations during the 2001 FMD epidemic and other documented cases of mass cremation, and this assumption "can be safely disregarded". This is what I would call a straw-man argument, as the difference between cremation results vs. fuel expenditure in Dresden vs. mass cremation of carcasses is not nearly as dramatic as Jansson tries to paint it. The results of carcass mass cremation are cremation remains sufficiently reduced to be referred to as "ashes" by related sources. So were the results of cremation at Dresden according to the above-mentioned documents, but it is possible that the actual results included many carbonized parts looking like those visible on the last five (graphic!) pictures shown here, which (as some eyewitness testimonies as well as crime site investigation reports suggests) were abundant at the AR camps’ cremation pyres. 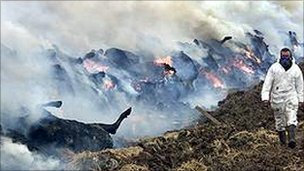 Such results would be unacceptable in present-day mass cremation of carcasses, judging by guidelines like the AUSVETPLAN Operational Procedures Manual Disposal Version 3.0, 2007 (a source provided by Jansson), which – as was already pointed out here – calls for "the hottest fire and efficient combustion" and for "complete combustion". However, they would be sufficient to meet the sanitary concerns of the Dresden city administration, and as concerns the AR camps, the perceived insufficiency of such cremation results to destroy the evidence of mass murder could to a large extent be made up by laborious post-cremation processing, with physical evidence suggesting that, besides lots of bone fragments, many a larger bone (including whole skulls or parts thereof) made it through both cremation and such processing. "Revisionist" arguments against the possibility of achieving complete combustion with the means available to the Dresden city administration and the SS at the AR camps have thus backfired against their proponents – predictably so, as they attack a straw-man version of what the results of cremation at these camps are "alleged" to have been, rather than what evidence actually shows these results to have been. 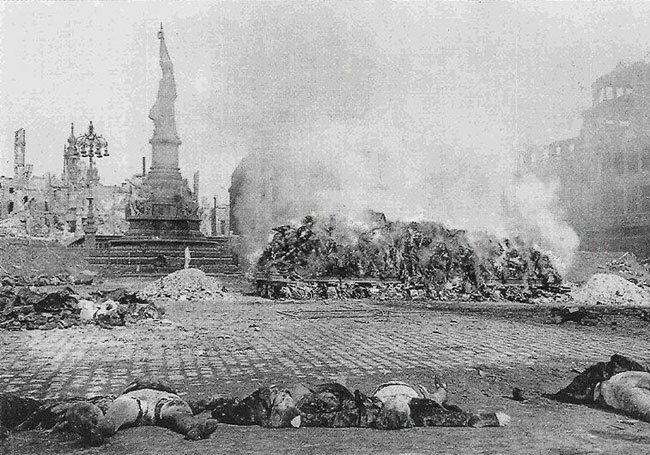 As concerns fuel requirements, the Dresden pyres would – especially if one considers that the cremation results were less thorough – also not be all that different from carcass mass cremation, assuming that they were conducted with the comparatively low amounts of fuel placed underneath the pyres, with straw placed in between the corpses (mentioned by Irving) and with a total of about 68,000 liters of gasoline, which corresponds to the fuel to body mass ratio of 0.56 kg (of wood or wood equivalent) per kg of corpse that I assumed for the AR pyres (Mattogno, as pointed out at the end of this blog, amusingly seems to consider this amount of gasoline too high). As I showed in this blog, fuel to body mass ratios close to or even below 1:1 are likely to have been achieved in mass cremation of carcasses, especially in some of the cases or according to some of the sources that were presented by Jansson’s fellow "Revisionist" Heinrich Köchel. 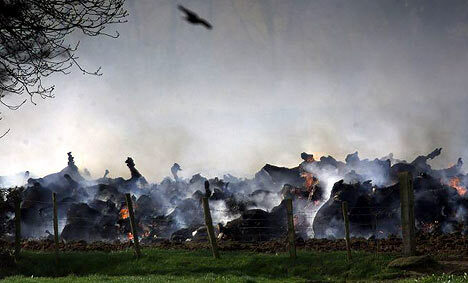 The difference in ratios may to some extent be related to the fact that, as I argued here and here, present-day desiderata related to environmental/legal requirements in connection with carcass burning are more rigorous than they were in the early 20th Century. Such desiderata may influence the type and amount of fuel considered necessary in carcass cremation, and lead to fuel expenditure being higher than it would be if cost efficiency were the only criterion in establishing fuel requirements. So accepting as essentially accurate the evidence regarding mass cremation at Dresden – or, for that matter, at the AR camps – does not require assuming that the pyres at these places "proceeded in a fashion enormously superior" to cremations during the 2001 FMD epidemic and other documented cases of mass cremation. This, in turn, means that Jansson has lost his argument already. From this sober conclusion I move to what seems to be the only valid point in Jansson’s blog, namely that there is no evidence – such as an eyewitness testimony – to the presence of cremation specialists from the Treblinka extermination camp on the Dresden Altmarkt, mentioned by various scholarly sources including Taylor’s book (whose author was careful enough to write, in the excerpt from his Dresden book quoted here, that the "outside SS experts" supervising the Dresden Altmarkt cremations were said to be "former staff from the notorious extermination camp at Treblinka", thus suggesting the possibility that this assumed provenance was a rumor or conjecture). Indeed the footnote of Arndt/Scheffler’s article quoted by Jansson suggests that the presence of former Treblinka staff among the Ukrainian auxiliaries involved in carrying out the cremations (Jansson lamely argues that Ellgering mentions such auxiliaries "only for burial work", thereby pointing out the likely possibility that they were also used for the other form of body disposal, which in the end involved burial – of the cremation remains – as well) was merely a conjecture of Arndt and Scheffler, as their expression "fairly certain" ("ziemlich sicher") suggests. However, and unlike as concerns the telling absence of evidence that anyone was "transited" via the AR camps to the occupied Soviet territories (which, for the reasons explained i.a. here, is conclusive evidence to the absence of such "transit"), absence of evidence is not evidence of absence in this case. For it would have made perfect sense to entrust cremation on the Dresden Altmarkt to people who had some experience in the field, and the similarity between the cremation arrangement in Dresden and that at Treblinka (except for the missing pit underneath the grates, as no pit could be dug in a cobble-stoned city square) is rather striking. In support of his gasoline argument, Muehlenkamp cites the Eichmann trial testimony of Kalman Taigman concerning the existence of a tank of petrol in Treblinka. He does not acknowledge that Taigman is a lower camp witness, and fails to explain why testimony indicating the existence of a gas tank in the lower camp should be viewed as offering support for the notion that large quantities of gasoline were used for cremations in the upper camp. 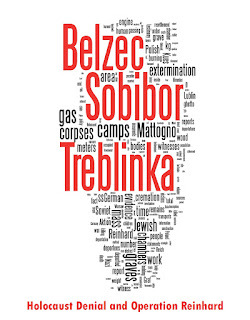 A sufficiently dimensioned gas deposit provided – Treblinka is known to have had a gas deposit, which was set on fire and exploded during the revolt on 2 August 1943 - , this extermination camp would have had no more logistical problems than the small gas station in the above example. See for instance the deposition of Kalman Teigman at the Eichmann Trial, session 66. The witness spoke of "several thousands litres of petrol", but this may well have been an underestimate. How many people knowing nothing of the subject would look at a large tank truck and estimate that it carries up to 34,000 liters? Visitors to the port wine caves in Porto are informed that the largest barrels of Ruby port contain 80,000 liters. Who would have guessed? As one can see, Jansson’s "fails to explain why …" finger-pointing is rather out of place in this context. I attribute this piece of out-of-context dishonesty to Jansson’s familiar bitching urge. The same goes for what follows, as Jansson berates me for not having "bothered" (a favorite catchword of his) to examine "the testimonies concerning the Treblinka cremations". This is unsurprisingly followed not by the testimonies "concerning the Treblinka cremations", but by a short list of conveniently selected (and presumably somewhat misrepresented) testimonies which, due to their sparseness of detail and/or the witnesses’ tendency for (depending on the perspective) maximizing or minimizing hyperbole (the latter being especially a characteristic of Eliahu Rosenberg), seem to support Jansson's "as alleged" straw-man whereby liquid fuels were either dispensed with entirely or "used in very moderate quantities". Especially amusing – in that it mirrors similar nonsense produced by "Dean Irebodd" (aka Ugly Voice (denierbud)) – is Jansson’s argument that, as eyewitness Jerzy Rajgrodzki mentions fuel wood in connection with kitchen work but not in connection with cremations, he "really is saying that the bodies burned on their own, without the help of any additional fuel". Arguments of this nature make me wonder whether "Revisionists" like Jansson actually have brains inside their skulls, moreover as Jansson calls this showpiece of idiocy "significant". Ouch. One of Jansson’s own favorite quotes (Schiller’s "Mit der Dummheit kämpfen Götter selbst vergebens") comes to mind. Back to more serious matters, what historians have established regarding external combustion agents at Treblinka, based on the testimonies of a number of eyewitnesses including Rosenberg and Rajgrodzki but also former SS-men Mentz, Münzberger, Matthes and Stangl, among others, is that the agents were dry wood and brushwood as well as rags and pieces of wood drenched in gasoline, diesel oil and crude petroleum (Sara Berger, Experten der Vernichtung, p. 212 and footnote 118 on p. 550). 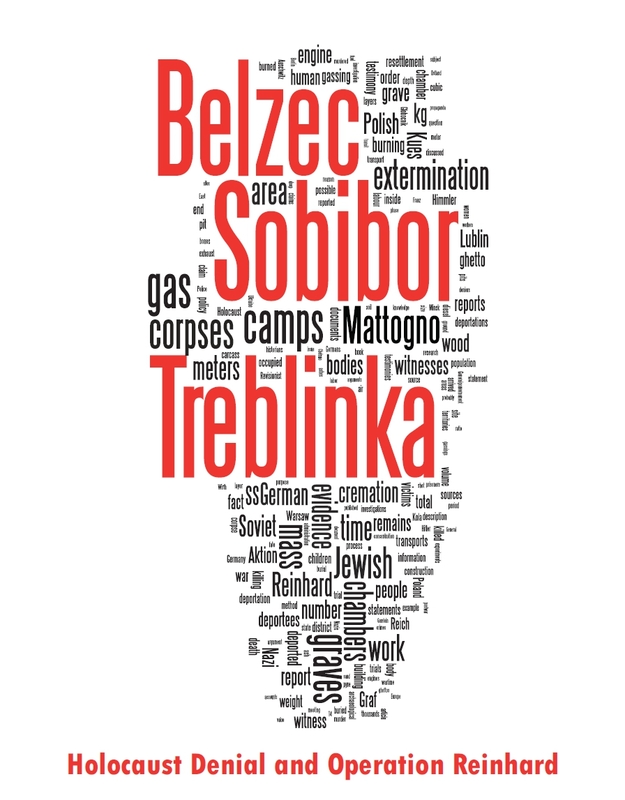 Matthes is quoted by Arad on p. 174 of Belzec, Sobibor, Treblinka. The Operation Reinhard Death Camps. The quote mentions brushwood placed under the rails and doused with petrol, with no indication that said fuel was "used in very moderate quantities". The one Treblinka upper camp eyewitness whose account The Last Jew of Treblinka I have read, Chil Rajchman, is also somewhat hyperbolic, e.g. when he claims that the "finished" ash after post-cremation processing had to be "free of the least bits of bone and as fine as cigarette ash" (postwar photos showing the soil of Treblinka littered with bone fragments and larger bones suggest that this principle was at least not always adhered to). Or when he claims that the specialist he calls the "Artist" lit the brushwood underneath the corpses with a match, something he would not have done if the wood was drenched with petrol, as mentioned by Matthes. Etc. It is clear that the accounts of traumatized and hardly objective survivors like Rajchman cannot be taken at face value as concerns all information contained therein. On the other hand, Rajchman also provides information that is probably accurate, e.g. the one that the body parts of the corpses incinerated in what he calls the "ovens" often "kept their shape", and that it was not uncommon to "take out whole charred heads, feet, bones etc.". This incompleteness of cremation is also mentioned, with no indication of one having influence the other, by Treblinka guard Leleko. As concerns the early and unsuccessful cremations in a pit, which he dates to December 1942, Rajchman mentions that "a lot of petrol was poured in" but still "the corpses did not want to burn well". And his mention that, after an efficient cremation system had been implemented, "the corpses dug out of the pits burn even better than those of recently gassed people" , which is in line with Rajgrodzki’s testimony whereby the bodies (presumably meaning those extracted from the mass graves) burned well enough without having to be sprinkled with fuel (presumably in addition to the fuel in which the solid flammables underneath the grates were drenched), is also not without interest, in that it points to corpses dried up during the decomposition process having been much easier to burn than fresh ones. A short video I have referred to before shows a dry bovine cattle carcass being at least substantially carbonized using what seems to be only a small amount of gasoline (lit from a safe distance by throwing a burning twig into the place where the gasoline has been sprinkled). This takes us to the suitability of gasoline as fuel for mass cremation. Gasoline is not without risk to its users due to its volatility, which is why some guidelines about carcass cremation recommend against its use, see for instance here. On the other hand, it is one of the fuels permitted for burning carcasses by the Texas Commission on Environmental Quality, according to this page featured by the Texas Animal Health Commission. This speaks against it being considered inefficient. Jansson refers to an article by John DeHaan whereby gasoline bums off very quickly, and "damage from the flames will only rarely exceed splitting and charring of the dermis" (DeHaan). However, this refers to cases where an individual is covered to some extent with gasoline and then set on fire; it tells us little about how gasoline would work as a combustion agent on a pyre, namely when used to drench solid flammables as in the AR camps' pyres. Apparently Jansson found no source stating that gasoline is not efficient when used in this context, so he preferred to base his argument on a compound containing gasoline known as napalm. As concerns napalm, Jansson quotes an excerpt from a 1967/68 UK report, which does not exactly help his case in that it only expresses the opinion of an official entity (the Royal Armament Research and Development Establishment of the Ministry of Defence, hereinafter RARDE) whereby napalm would be "not be successful" in the sense that it use would not be "more satisfactory than the use of coal and wood". So what, Mr. Jansson? Not more satisfactory doesn’t mean unsatisfactory. 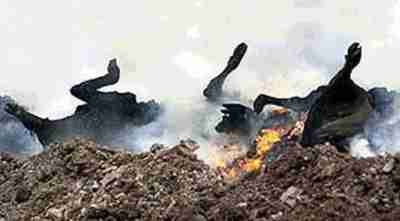 • Napalm reportedly disposes of cattle carcasses in 60 minutes (NABC 2004), whereas pyres may take up to 3 days. • Napalm is easier to control. 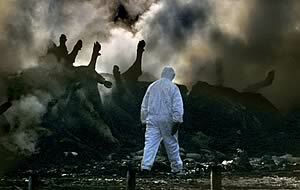 • Napalm burns at about 1000 °C, ensuring the required destruction of infected carcasses and pathogens (Anonymous 2001). Despite these apparent advantages, one drawback for use of napalm is poor public perception based on the chemical’s devastating wartime history. Use of napalm also requires special training. Given that napalm has never been used in Australia, and that equipment and reagents are not commercially available here, issues with availability and expertise in Australia may also be a disadvantage. Everything said here. With all due respect for the RARDE, there are equally competent entities who think that napalm would technically be a good solution for mass cremation of carcasses. The main reason speaking against the use of napalm for carcass mass cremation is not inefficiency, but the fact that the word "napalm" evokes image like this one. This sad performance of Jansson’s is followed by the most bizarre of his arguments, which concerns a source that I refer to i.e. here, in connection with my calculations about how long it took to cremate the corpses at each of the three AR camps. Jansson calls this source one of the three "planks" in my "empirical platform", which – as he probably knows but expects his readers not to know – is a stark exaggeration, obviously meant to make Jansson’s "memo" look important to his fellow "Revisionists". I refer to this source, which according to my calculations suggests an average pyre throughput (kg of carcass/corpse combusted per hour and square meter of grate) higher than that of Lothes & Profé’s experiments numbered "I" to "III", but lower than that of their experiments "IV" to "V". As I show that the cremation time suggested by evidence was sufficient at all three camps even assuming the lowest throughput, that of Lothes & Profé’s experiments "I" to "III", and the arguably generous times I considered for pyre preparation (the only "critical" camp is Bełżec, where the lowest throughput scenario would only mean that the cremation period would have been longer than 150 days, which I argue would "not be incompatible with the evidence insofar as at least one bystander witness mentioned cremation throughout the spring of 1943 and the stench of exhumed bodies was still noticed by another witness in April 1943, according to Reitlinger"), Jansson’s claim that the aforementioned "Report To Dumfries and Galloway Council" (hereinafter RDGC) is one of the three "planks" of my argument can only be called ridiculous. That said, what has Jansson got to offer by way of arguments against the RDGC? Not much. After a long and pointless sermon about the report having been written six months after the cremation it refers, by "a company that played no role in the actual process of the cremation" regarding a topic ancillary to the cremation process (air quality monitoring), and about the report supposedly contradicting "works written for the sake of those who actually carried out cremations", Jansson provides no evidence that the cremation times I calculated based on information in the RDGC are wrong. The best he’s got too offer is some lame mumbling (which he considers worth illustrating with a photograph) whereby the report contains an error regarding the width of the pyre, which he claims was 2.5 meters or more in all FMD cremations. This error, so Jansson boldly concludes, means that the other figures in the report (namely those regarding the cremation’s duration) are "erroneous as well". Needless to say, what we have here is a non sequitur conclusion, to put it politely. One figure wrong doesn’t logically mean that all figures are wrong. Thus ends the argumentation part of Jansson’s last "memo" blog before the conclusion – one minor point (regarding evidence to the presence of former Treblinka staff on the Dresden Altmarkt, see above), the rest falsehoods and other garbage. What follows are two paragraphs of Janssonian rhetoric. d) even if L&P’s results had "only" been a complete carbonization, this wouldn’t get Jansson anywhere for the reasons explained at the end of installment 5.2, namely because there’s strong evidence suggesting that cremation at the AR camps was also rather incomplete. As to the first paragraph’s last sentence, one can only laugh (to borrow one of Jansson’s favorite catchphrases) at Jansson’s straw-man claim that I seek to "overturn" what he calls "all experience concerning the reality of mass cremation", which is not at all what my argument is about. On the contrary, present-day cremation experience is rather favorable to my argument, in that it shows the fuel to body mass ratio postulated by MGK to be way too high, ratios below 2:1 and even close to or below 1:1 having been achieved in some cases of mass cremation – despite their being conducted in accordance with requirements more stringent than those in the early 20th Century as concerns the environment, the health of sensitive persons and other aspects, presumably also as concerns the thoroughness of combustion. By presenting my "flimsy" sources from times closer to the events under discussion, I additionally take into account the impact that lesser requirements in those times and L&P’s particular method, which was replicated on a massive scale at the AR camps and at Dresden, had on fuel consumption. Given the complete failure of Muehlenkamp’s cremation evidence, we are back to the conclusions reached by Mattogno, Graf, and Kues: the alleged Reinhardt cremations cannot have taken place as claimed, and therefore the alleged Reinhardt extermination also cannot have taken place as claimed. Even if the "complete failure" assumption held water – which, as demonstrated throughout this series, it does not – Jansson’s conclusion would be either irrelevant or a non sequitur, depending on what he means by "as claimed". If "as claimed" just means the straw man of complete destruction of the physical evidence by cremation that "Revisionists" derive from the accounts of certain eyewitnesses and the mistaken assumptions of certain judges or historians about the degree of physical evidence erasure, then Jansson’s exercise, like those of Mattogno, would go under "much ado about nothing", as I have no problem at all with the notion that – as suggested by other eyewitness accounts and the physical evidence, also mentioned in this blog series – cremation at the AR camps was rather incomplete and even post-cremation processing left behind larger human remains in considerable amounts. On the contrary, I made this argument regarding Treblinka (and thus regarding the other two camps as well) in the HC critique (pp. 448/449, see also this blog) and also in a much earlier blog, the one headed Incinerating corpses on a grid is a rather inefficient method …. In other words, if Jansson had just meant to argue that cremation according to Lothes & Profé’s method, and accordingly cremation at the AR camps and at Dresden, cannot have achieved the same degree of combustion as mass cremation of carcasses in more recent times, he would have been crashing into an open door all the time. If, as is more likely considering Jansson overall stance, "as claimed" means that mass extermination at the AR camps on the documented scale didn’t take place at all but the deportees were "transited" eastward to the occupied territories of the Soviet Union, we stand before another of those assertions that make me wonder if "Revisionists" have brains inside their skulls, for a number of reasons including, without limitation, those mentioned here. However much "Revisionists" may kick and scream, the bottom line remains that the body of documentary, demographic, eyewitness and physical evidence points in the direction of the AR camps having been sites of mass killing that none but a handful of the deportees taken there left alive, and not in any other direction. So if "it" could not have happened "as claimed", this would just mean that "it" happened differently and that certain people’s notions about the amount and size of human cremation remains reburied in the mass graves or scattered over the land need to be revised. Big deal. The hollow bragging and pathetic clowning in the last three sentences of Jansson’s piece provide further insight into the deplorable contents of Jansson’s mind and are accordingly counterproductive for Jansson. They illustrate the despicable nature of "Revisionists" like Jansson, which is what fuels my interest in a subject I wouldn’t otherwise think much about (also but not only because I’m aware that, as becomes apparent from the comparisons in this blog, even the whole of Nazi Germany’s genocide of the Jews - of which Aktion Reinhard(t) was but a part - accounted for but a fraction of human death and suffering in the 20th Century, man-made of otherwise, and for an even much smaller fraction of the horrors that have afflicted mankind throughout its history). 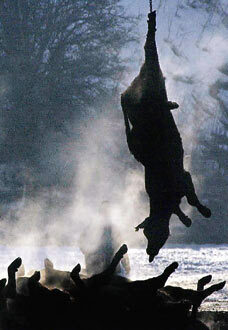 My hunting blood responded at once, and I forgot all the misery and sickness I had gone through. Though I’m not a hunter (and don’t intend to become one as I don't want to shoot down animals), I figure that my passion for "shooting down" intellectual garbage like Jansson’s (which I again have time to pursue since about April of this year, though I don’t know for how long) resembles a hunter’s passion as he stalks his prey. So please keep the garbage coming, Mr. Jansson. 1. It always amuses me to see the word "courage" used by someone who is as afraid of certain historical facts as Jansson obviously is, and who seems to be as afraid of my questions – e.g. the ones asked here – as big fat Göring seems to have been afraid of Dimitrov’s questions at Reichstag fire trial (see William Shirer’s The Rise and Fall of the Third Reich, p. 193 of the 1960 edition by Simon and Schuster, New York). I’m again moved to suspect that, like one of his more primitive coreligionists, Jansson tends to babble about a quality he would like to but does not find in himself. 2. It also amuses me to see that I’m the only one of the "controversial bloggers" Jansson mentions by name and dedicates some extra rhetorical bluster to (which, for extra fun, includes a mention of "scholarly terms", suggesting that Jansson considers the "scholars" who produce the "Revisionist" faith’s scripture, among whom he would apparently like to be, the only "real" scholars on the planet in matters of historiography). This suggests that I’m the "controversial" blogger Jansson hates most, unsurprisingly so after his lamentable performance in our discussions. That said, I thank Jansson for having lived up to my expectations in providing some useful input for my response to Mattogno, which will be duly acknowledged in footnotes.